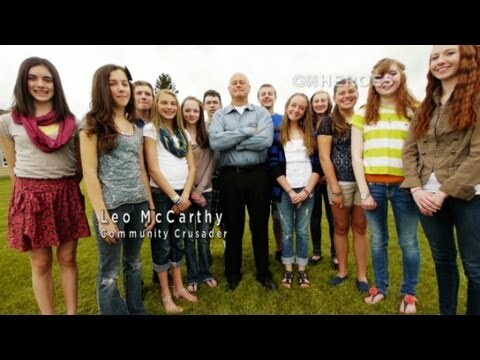 If you live in Butte, you probably know who Leo McCarthy is, like many other people across the country. That’s because Leo McCarthy is the man who founded Mariah’s Challenge after his 14-year-old daughter Mariah was killed by a drunk driver in 2007. He has been recognized by CNN as one of its CNN Heroes in 2012. Mariah is forever 14. I can’t get her back, but I can help other parents keep their kids safe. Mariah was killed when a drunk driver hit her when she was walking home with two friends in Butte, Mont. But Leo McCarthy refused to let Mariah’s tragic death become just another statistic. Knowing that the driver was just 20 years old; not even old enough to drink legally, Leo McCarthy made an unusual promise to the teenagers attending Mariah’s memorial service in Butte, Montana. Together with Jimm Kilmer and Chad Okrusch, the fathers of Mariah’s two friends who survived the accident, Leo McCarthy started a non-profit organization which has raised and given out more than 140 scholarships to Butte high school students over the years, for not drinking. I wanted to give them encouragement and to tell them that you can be better and always be greater in the situation – Leo McCarthy. The city’s drinking culture dates back to its history as a major mining town in the late 1800’s, when it attracted boatloads of Europeans seeking better opportunities and a new life. Miners often went as deep as one mile underground to dig iron ore. It was a tough work and many of them often liked to drink at the end of the day. However, it’s not just Butte that is struggling with the problem. According to CNN, Montana routinely ranks in the top five per capita for drunken-driving fatalities. Those troublesome statistics, along with Mariah’s story and other high-profile deaths, have led legislators to seek more aggressive ways to address the issue. Leo McCarthy said he hopes that by adopting Mariah’s Challenge, the teenagers of Montana will slowly change this statistic. To be eligible for the Mariah’s Challenge scholarship, teens must sign a pledge to not drink until they are 21 and not get into a car with someone who has been drinking. In their senior year of high school, they can submit a scholarship application as long as they haven’t been convicted of under-age possession of alcohol or drugs. If you are over 21, do not drink and drive and be a good role model for our children. If you sell alcohol, check IDs, train your employees to obey the law and keep alcohol out of the hands of our children. Since 2008 almost a quarter million dollars have been raised to hand out as scholarships to students who successfully meet the challenge. So far $236,000 has been awarded to graduating Butte seniors who accepted and live out the ideals of Mariah’s Challenge. The 2014 Mariah’s Challenge Scholarship has been awarded to Fifty-five students from Butte Central, Butte High, Jefferson High and Whitehall High. Butte citizens expressed their pride towards the student winners and lauded the positive paradigm shift that has occurred within the city. It would have been so easy to build a monument to misery and light the torch of vengeance. But we decided to go the tough way, the hard way, which is acknowledging we can all be better and we can always bring good out of bad. There is grace in that and there is a deep peace in that. Said Leo McCarthy. Want to get involved? Check out the Mariah’s Challenge website at www.mariahschallenge.com.